Looking for Bugs, Day or Night! Ever wonder which marvelous moths and beautiful beetles are out and about at night? And what about the darting dragonflies and active ants that fly and crawl about during our hot summer days? 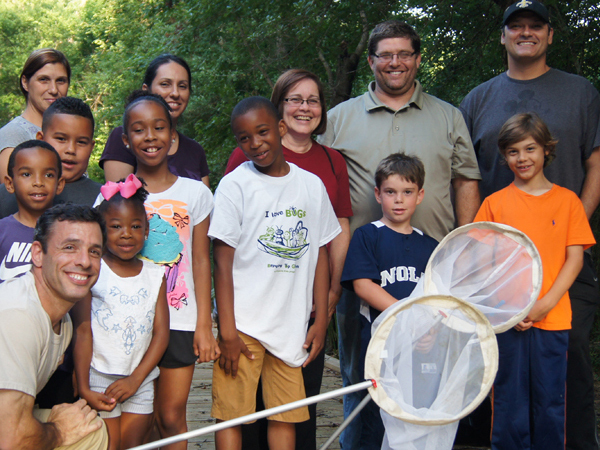 Join Audubon entomologists at Audubon Wilderness Park and Audubon Louisiana Nature Center and learn about the fascinating bugs that inhabit south Louisiana. You’ll see lots of insects and spiders while hiking trails and (at night) others that are attracted to lights at Audubon’s facilities on the west bank and in eastern New Orleans. Age: Guests must be 6 years of age or older. The adult to child ratio is 3 children to 1 adult. The maximum number of people for each adventure is 20. Registration includes an insect collecting kit, a headlamp with batteries (Wild Night) or an aerial net (Insect Adventure), and an exclusive Wild Nights & Insect Adventures collectible water bottle. Let us know of participants have any allergies. Registration fee includes a ticket to Audubon Butterfly Garden and Insectarium to use at a later date. The rain dates for each will try to be scheduled for the day or night following the originally scheduled date.